A computer at home broke its CD drive, so after a new one was bought and installed, I nabbed the old one. I hoped to find interesting things inside and maybe I could use some parts for future projects. I'm researching and thinking about how I might use the moving frames as part of a plotter or something like that. The stepper motor and the moving frame for the CD read/write head could be pretty useful. Here are some pictures and descriptions. All the main parts laid out, as viewed from the back of the drive (probably should have made them all face the camera :P ). The circuit boards are mounted underneath the cream-colored plastic frame, and the black CD tray slides into tracks on the top of the frame. I've taped the front cover of the drive to the tray for convenience and to keep track of it. This next picture is the main mechanism for opening the the CD drive and sliding out the tray. As you might expect, the tray is driven out by a rack and pinion. The driving pinion gear is the large black one in the upper corner. It is driven by a motor that normally pokes up through the curved, U-shaped space visible in the center (this drives the smaller black pulley with a rubber-band like belt). The white plastic bar is instrumental for multiple things. When it is all the way to the left or right, the tray itself interacts with it and pushes it into the pinion gear, which moves it further. But then it gets moved out of the reach of both the pinion gear and the tray. It sits in one position or another (all the way right or left) until the tray moves the opposite way, interacts with it again, pushes it into the pinion gear, which moves it back the other way. More pictures of this later. The CD read/write head and spinning motor frame is partially visible here (hereafter called the "rocker frame" for lack of a better name, because of the following description). This actually swings/falls down and away from the tray when it moves out. The front mechanism also involves this motion. When the white plastic bar moves sideways, it moves the rocker frame up and down. There are nubs in the frame that stick into the curved grooves in the white bar. These S-shaped grooves are also partially visible, since the rocker frame is in the down position. If the CD drive jams, a paperclip can be poked through a hole in the front to open the tray. I've always wondered what it pushes inside. It goes through the square hole on the left and pushes the stubby, left-facing-L-shaped, white piece of plastic, which swings and pushes the white bar to the side by the straight bar it's a part of. The small green circuit board is for burning LightScribe disks. They have tops that text or images can be burned into, I think with a laser. A clearer overhead view of the front mechanism. 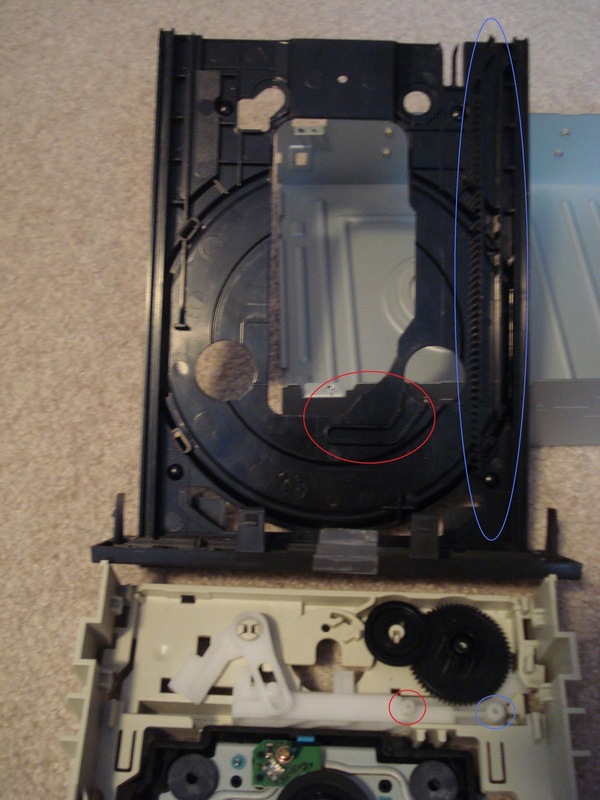 Here is a picture that includes a bottom view of the CD tray (as if it was flipped up). Here you can see the grooves that interact with the rest of the drive. This picture is annotated below. The red parts interact with each other at later times than the blue parts. I'm not exactly sure when or in what way, exactly. But at the ends of the highlighted grooves in the tray there are angled parts that move the nubs on the white bar, so that's the basic idea. A front view of the drive with one of the circuit boards laid into place. The previously mentioned piece of plastic that the paper clip pushes on is close to the hole now. A view of the front mechanism circuit board. The center black square with the two buttons sticking up is used to see if the tray is fully in or out. See the next picture. In the middle you can see those two buttons. They normally poke up farther through the cream-colored plastic frame if the circuit board was attached completely. The rectangular tabs on the white bar slide over the buttons and depress them in certain positions. The upper tab is close to one of these buttons in this picture. A bottom view of the rocker frame, with the CD read/write head and spinning motor. The rocker frame attaches to the main frame here with latches holding onto short axles for when it swings away from the CD tray. The rocker frame taken out. Note the two black nubs mentioned earlier, now facing the bottom right corner of the picture. See the next picture. Those nubs fit into these S-shaped grooves, also mentioned earlier. A close up on the motor and screw gear that move the read/write head. I believe this motor is a stepper motor because it needs to be precise and because there are four electrical connections to it. Here's a view of the read/write head. It's a precisely balanced laser with a lens. Notice the wires and silver metal blocks which appear to be magnets. I believe this is how the lens is precisely positioned. Another view of the lens.